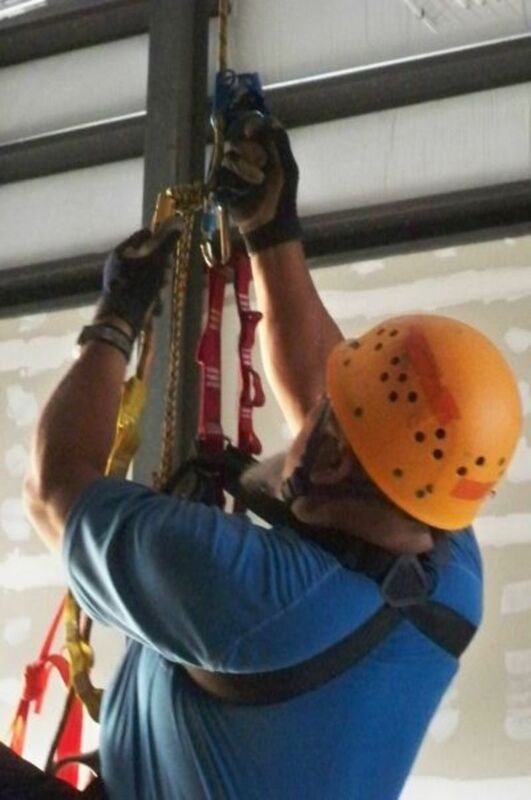 Four years ago, I began training for our Search & Rescue team's technical rescue group in a series of class and field sessions collectively known as the Rock Rescue Academy. 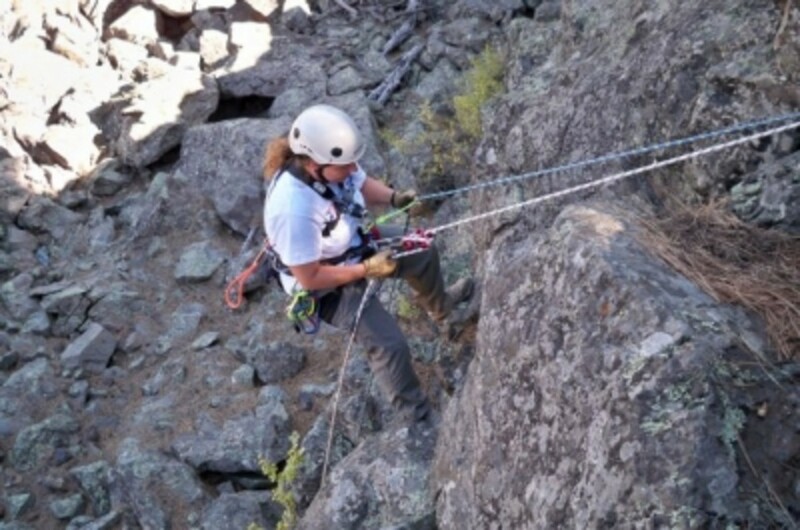 Between training sessions, I spent many additional hours practicing those new skills (that's me in the photo, rappelling), trying to commit them to memory both mentally and physically. And in September, all new and existing tech team members took the annual proficiency test. For that test, all of us were required to have purchased certain pieces of equipment for ourselves, rather than use team gear. During an actual mission, there may not be enough team gear to go around, and we always need to have proper equipment for our own personal safety. Now I know there's a significant difference between a recreational climbing harness and a rescue harness. But I wish I'd known that before I took the advice of an employee at a local climbing gym and spent just under $100 for a harness from their store. Not knowing a thing about climbing, tech rescue or the associated gear at the time, I'd just walked in and said, "I need a harness for Search & Rescue" and went with what the girl sold me. That was a mistake. I mean, I suppose it doesn't hurt to have an extra harness around, especially if I decide to take up rock climbing. But my Black Diamond Aura harness, while probably great for sport climbing, just doesn't cut it for rescue work. For one, it gets rather uncomfortable if I have to be on the rope for a long period of time, hanging around so to speak. And it's got too much length between the leg loops and the belay loop. When I hang on the harness, that extra length means that it stretches, and my gear ends up too high on my waist. At any rate, after checking out some recommendations from teammates, I bought myself a Metolius Safe Tech Waldo Harness from a company called Rescue Response. The Waldo has thick, 1/2" foam padding around the waist and legs, so it's very comfortable. 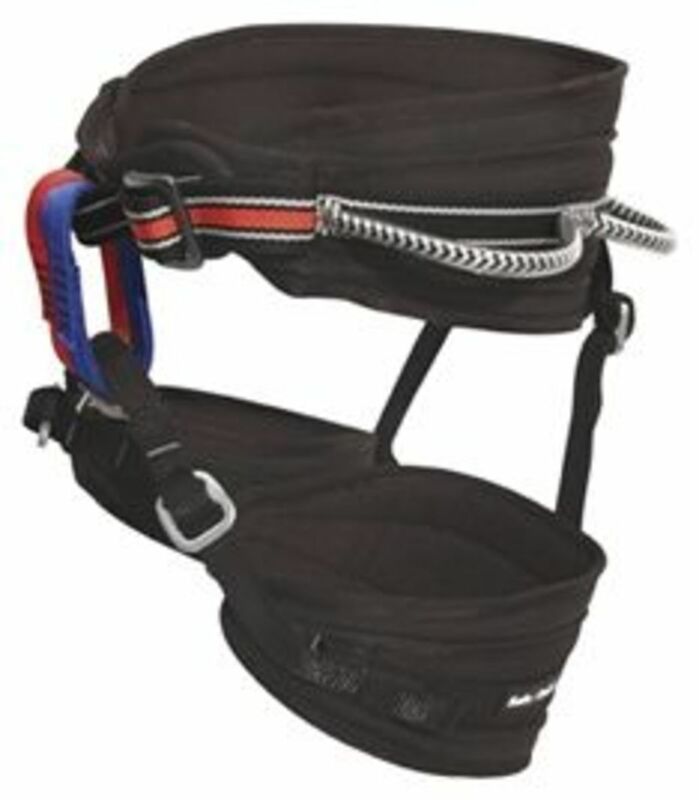 This harness also has "Safe Tech" features, including four 10kN gear loops, a 16kN haul loop and 6.6kN rear leg loop straps, with no low-strength components. 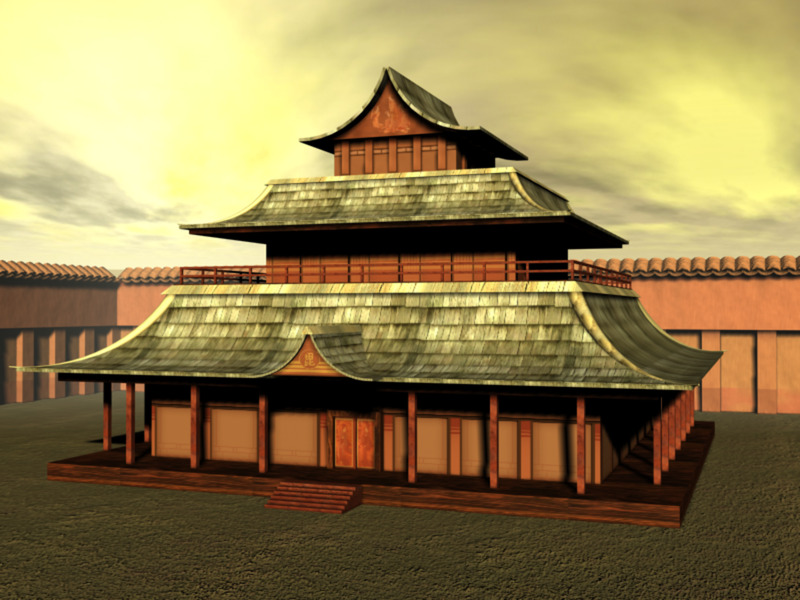 And you can adjust the rise length and leg size to obtain proper fit. The small rear loops can double as hammer holsters, and a second belay loop was added to minimize the problem of "gear cluster." I started off with the Black Diamond climbing harness shown here (yellow), but it just wasn't cut out for rescue work. 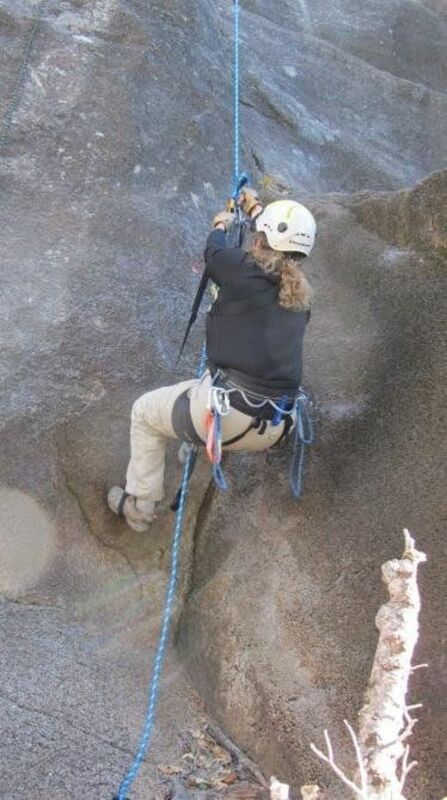 Then I switched to a Metolius rescue seat harness, which I'm using here as I ascend. Sure, you can fashion a chest harness from a piece of webbing like you'll see in the photos above and below (the orange webbing), but not only is it rather uncomfortable (and it doesn't look too good) but also difficult to adjust to the proper fit. 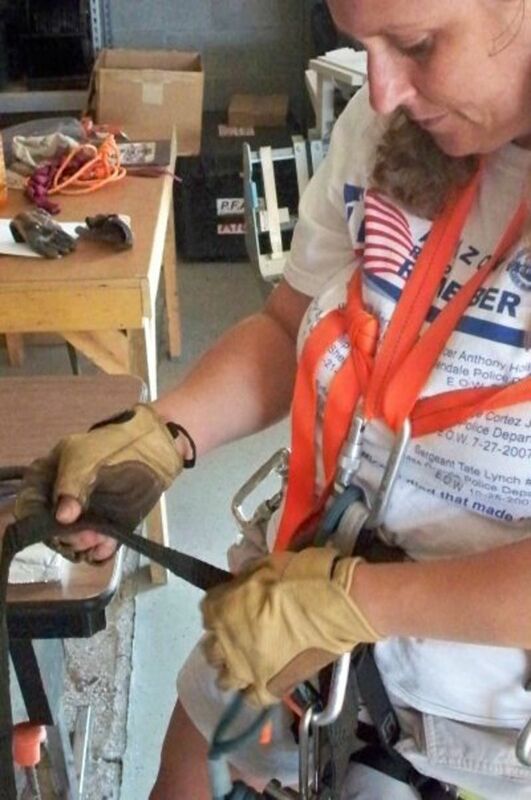 It was okay for the initial training, but our Coordinator required us to have a commercially sewn chest harness with a seat/chest connector for ongoing participation with the technical rescue team. And, having used the improvised harness for a few months, I definitely see why. So I bought myself a Petzl Voltige Chest Harness from AHS Rescue, a company serving "the serious recreational outdoorsman and ... emergency services and those who make their living working at height." I'm planning to use two D-rings (or Deltas links) with the chest harness, one 12mm to connect the two sides of the harness in the front, then a piece of Omni strap, cut with a hot knife to the right length, along with a 10mm Delta to attach the chest harness to my seat harness. At the moment, though, I haven't yet had time to cut the Omni strap and haven't purchased the Deltas, so I've been connecting the seat and chest harness with one carabiner. It's a little uncomfortable when I'm standing around for a while with the two connected like that, because I can't quite stand up straight, but the tight connection does feel good when I'm on the rope, helping to keep me upright. I found this harness SO much more comfortable than the improved chest harness I'd been using. Especially being a girl, if you know what I mean. Didn't squish as much. And it was easily adjusted to the perfect fit. I'm going to use Delta links to attach my Voltige Chest Harness to my Safe Tech Waldo seat harness, with a short piece of Omni strap between. At times, I'll leave out the Omni strap and just use one Delta to attach the two harnesses for even more support on the rope, like if attending to a litter over the edge. At first, I improvised a chest harness with orange webbing. But it was uncomfortable and difficult to adjust to the correct fit. 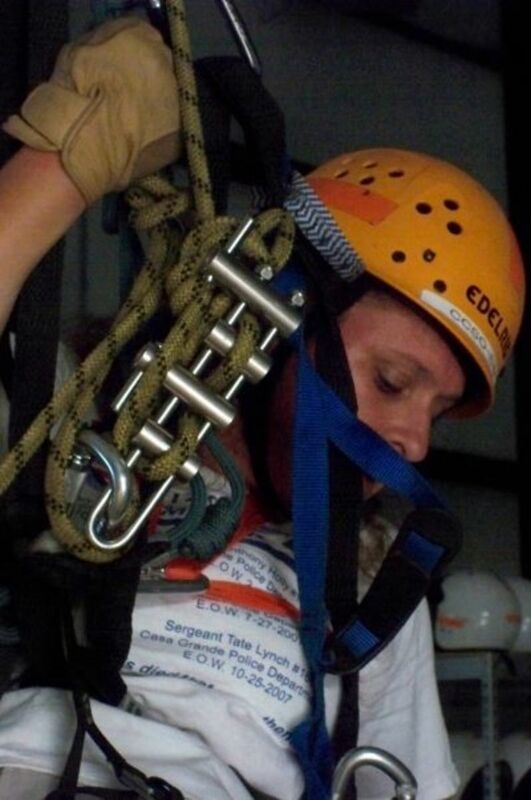 Then I got a much more comfortable Petzl Voltige, which I'm wearing here as I get ready to rappel. We're required to wear a helmet that's CE and UIAA-certified, and the Black Diamond Half Dome fits the bill. It's also comfortable and accommodates a headlamp, with clips on either side to hold it in place. In addition to the adjustable chin strap, there's a dial at the back to crank the helmet tighter around your head. This lightweight, 12.3oz helmet is lined with foam for additional comfort and has a wide brim to keep the rain off your face. There's a dial in the back you can turn to tighten the helmet on your head, and there are clips on the sides and back to hold a headlamp strap in place. I often use my helmet while on regular SAR missions, especially when in dense forest and/or at night, to protect my head from branches and also to hold my headlamp. It's more comfortable that way as opposed to being right on my head. 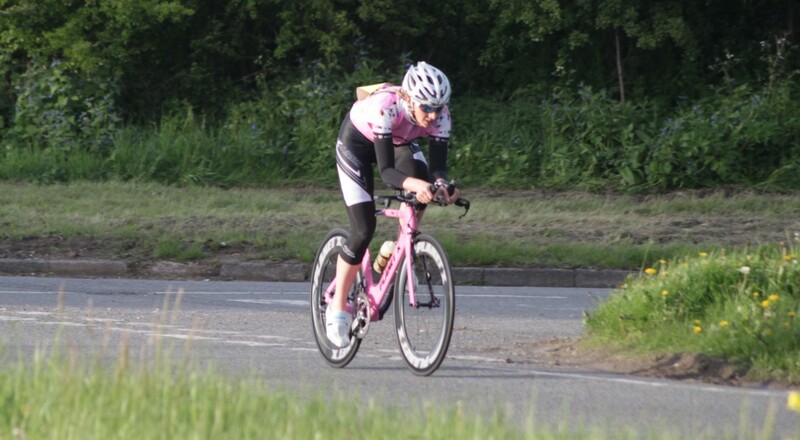 I used a team helmet (shown here) until I got my own. Then I got my own Black Diamond helmet, seen here while I'm rappeling. 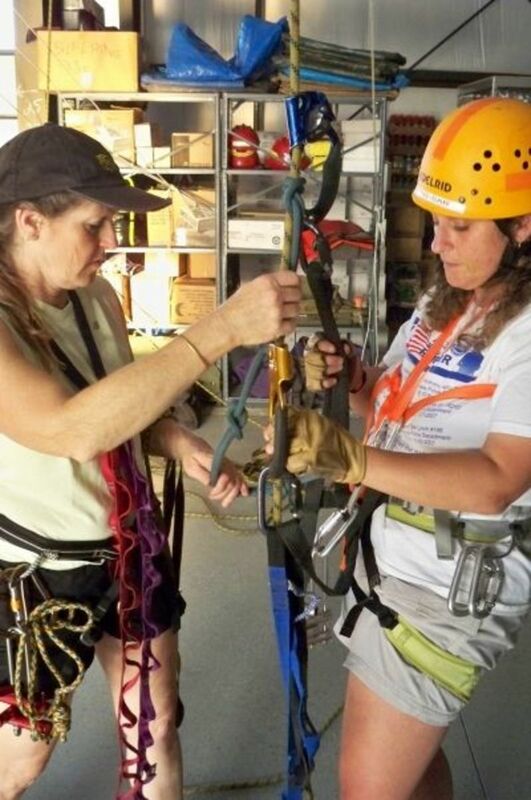 During training, we learned to use a personal rappel (or brake) rack, the Rescue 8, and a rescue rack. The rescue rack is similar to the personal one, but larger and stronger with additional bars for increased friction for heavy rescue loads. I much preferred the racks to the 8, because it's very difficult--if not nearly impossible--to adjust the amount of friction with the latter. I also found it harder to stop my downward motion and tie off with the 8 while mid-face. So when it came to buying a personal descending device, I went with a Hyper Extreme Mini Rack, as shown below. 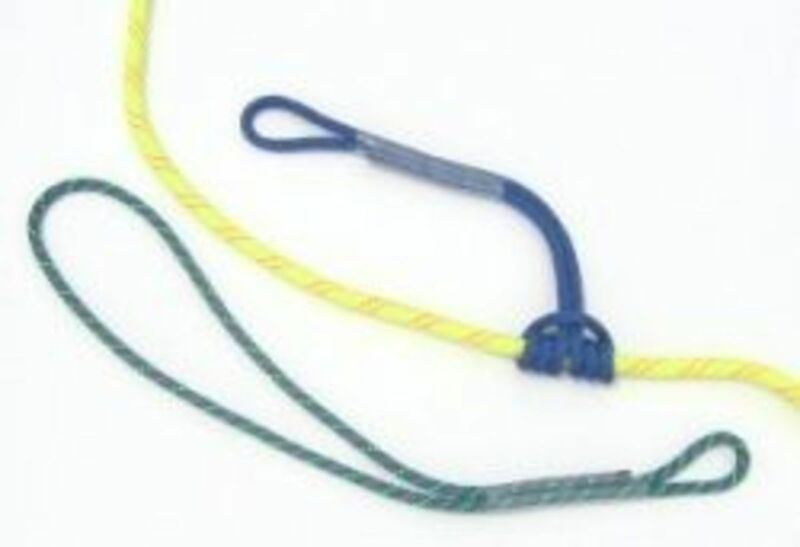 The Hyper Extreme has two small, vertical hyper bars, which help with both tying off and changing the breaking action from pulling up on the rope to pulling down. Pulling up to brake is more difficult and awkward, not to mention tiring on the arm. I prefer to have the two (vertical) hyper-bars on the rack as opposed to racks without them, because it's not only easier for me to lock off, but the bars also allow me to reverse the direction of pull for braking--down instead of up. One thing I did buy at that climbing gym that I still like and will continue to use are the Metolius Iron Hand 3/4 Finger Gloves. I'll need a different pair for winter use, but I like having my fingers free to manipulate equipment. They got dirty pretty darn fast but seem to be holding up very well to extensive use and abuse. I'm sure, though, I'll be going through numerous pairs as time goes on, so I'm going to pick up at least another one to have as a backup. This is a summer-weight glove with a polyester/spandex blend for breathable stretch and a leather palm for tough durability. If you're using these for free-climbing, there's a clip-in loop to stash the cloves on your harness when they're not needed. These 3/4 finger gloves allow me to easily manipulate my gear while protecting me from rope burns. This is a full-fingered Metolius glove, with comfortable cowhide outer molds, and split-cowhide reinforcements and triple stitching on the palm. The glove has a webbing clip-in loop and a hook and loop wrist closure. Locking Carabiners: so many to choose from. Here's a good excerpt about carabiners, including the pros and cons of steel versus aluminum 'biners, and how to properly load and care for them, from Fundamentals of Search and Rescue, written by Donald C. Cooper: Carabiners. We use Prusiks in a variety of ways, including for self-belays on a single rope, for tandem Prusik belays on a separate belay line, occasionally for ascending and so forth. 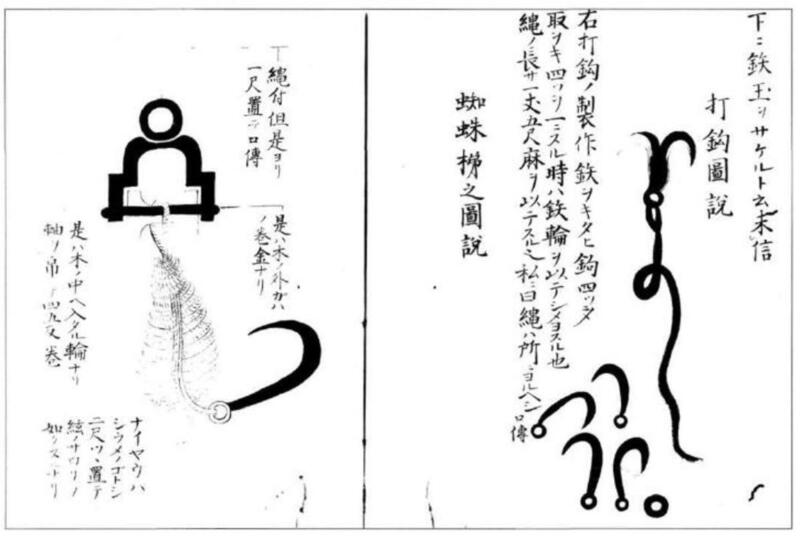 The rope used for a Prusik should always be of a smaller diameter than that which it's attached to. We often use 11mil. rope for main and belay lines, so our Prusiks are 8mil for rescue loads and 6 or 8mil for a single person (or personal) load. The difference in diameter between the main line and the Prusik should follow the general rule of a 60-80% ratio. Prusiks can be made by buying the rope and tying them yourself, or you can buy them pre-sewn, which is what I did so as to avoid having the double fisherman's knots on the Prusiks. They ship any order in the contiguous United States for a flat rate of $4.95, so several of my teammates and I placed our orders together. We also took advantage of their 10% discount for rescue personnel. Though we have the option of carrying a knife instead, our SAR coordinator said he recommends shears. 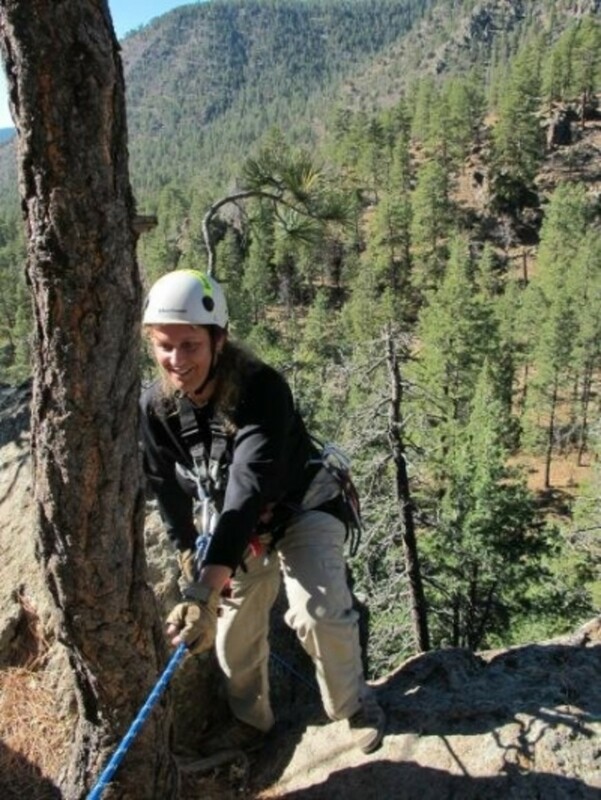 Reason being, it's so easy to cut rope under tension, and if, say, we're suspended while doing a pick-off (rescuing someone stranded mid-face) and pull out our knife, we could end up accidentally hitting our line or belay line with the blade. Not to mention the person we're rescuing. With the shears on the other hand, they can remain closed until we're ready to cut, so there's less chance of a mistake. 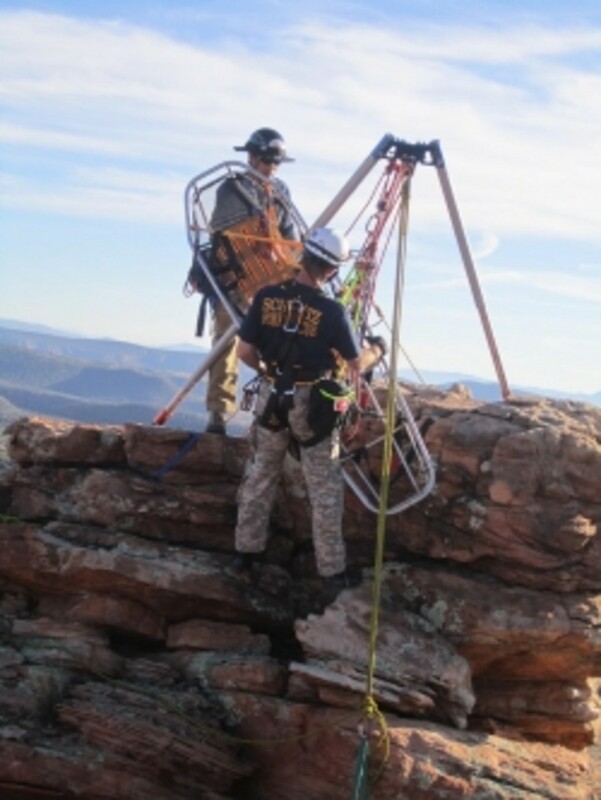 Offering a "Public Service Personnel Discount" to search and rescue team members, fire departments, tactical teams, high angle rescue teams and EMS squads. I called to place my order and spoke to Dale, who was very helpful. Selling technical gear in the categories water, industrial, rescue and sport. A Technical Rescue Rigging Guide Our Team Uses - We keep one of these around for the team for quick references, and many of us own our own. This book has lots of clear illustrations and photos, covering basic knots and anchors, to high lines, helicopter rescues and much more. A portion of the sale of this guide goes to support volunteer mountain rescue. Comments Or Questions About Technical Rescue Or The Gear? - Share them here. 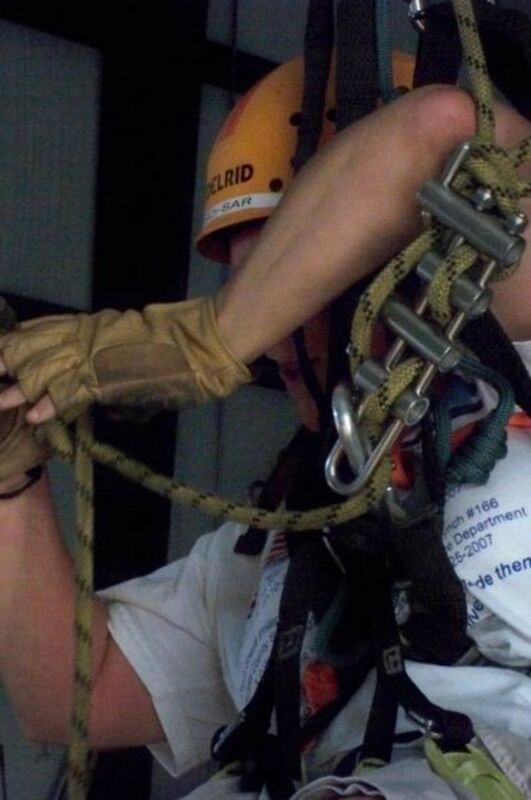 Love the info on this site, as an old abseiler still learning new tricks thereâs a lot to learn from this page. If anyone gets time check out myrope access london site to see how we do it in the UK. Anyone can say something is great. Thanks for showing us. www.cmcrescue.com is an excellent source for all of your rescue equipment needs. They can also make custom equipment to meet any special needs you may have. Great detailed lens. I can't imagine any climber wants to cut their rope by accident! Shears are a good thing. Great job with this lens. I'm not sure I could swing rock climbing. I've seen a lot of people do it, but I think I need both feet firmly planted in the ground. You look like you've done this quite a few times, so I trust your recommendations! Squid Angel blessed. A very complete resource -- but the closest you will ever get me to this is perhaps the gear for the canopy tours! I did that in Costa Rica -- let me tell you!!!! That was one serious stepping outside MY comfort zone as I yodeled through the tree tops. And once back on ground, adjusted that wedgie.